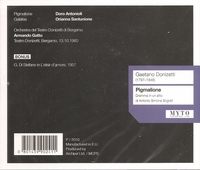 “IL PIGMALIONE (Pygmalion) is a scena lirica (lyric scene or opera) in one act by Gaetano Donizetti by an unknown librettist. It is Donizetti's first opera and was written between September and October 1816, when the composer was 19. It has been noted that although ‘musically slender, the score, nevertheless, reveals the fledgling composer's flair for melody’. The libretto for Donizetti's opera was based on one by Antonio Simone Sografi for Giovanni Batiste Cimador's PIMMALIONE (1790), in turn based on Jean-Jacques Rousseau's PYGMALION and ultimately based on Book X of Ovid's METAMORPHOSES.